Take a stroll in downtown Big Timber where you can find authentic goods. Capture those special moments in Big Timber through the lens with Christine Bakke Photography or buy some fine art photography. "Collect timeless fine art paintings, bronze sculptures, or vintage Navajo weavings at Hodges Fine Art." “One man’s junk is another man’s treasure”. Find a treasure at The Community Thrift Shop. Visit The Common Thread to find a fun adult coloring book, a great educational game for the kids, and some yarn perfect for that latest project. Enjoy a workshop at Two Rivers Gallery/Sweet Grass Arts Alliance and check out what local artists are creating. 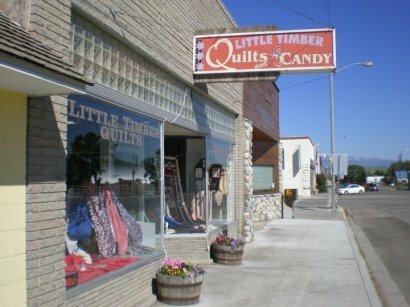 Enter the doors of Little Timber Quilts and Candy to find yourself in a quilter’s dream. Don’t forget to check out the candy counter. Browse the art collection at Montana Framing and Art. Peruse Cinnabar Creek, a gift emporium specializing in fine clothing, fine jewelry, books, espresso and beautiful gifts. Be surprised by the fun shopping that Big Timber Ace Hardware has to offer, it’s “no longer your grandfather’s hardware store”. Stumble upon a unique Montanan gift while venturing through Crazy Woman Trading Co. 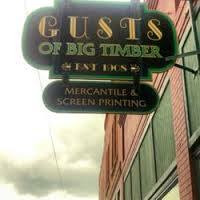 Dress to impress your western side with clothing from Gust’s of Big Timber. They also offer embroidery and screen printing. Watch a good movie from the comfort of brand new chairs at State Cinema. Book a private event to have an exclusive movie party. On the first Saturday in November come to the Big Timber Christmas Bazaar sponsored by the Big Timber Woman’s Club to shop at a bazaar with almost 100% hand-crafted vendors or come to another great bazaar, The PEO Spring Fling. Order a rifle or watch the making of one at Shiloh Rifle Manufacturing, a fine historic rifle manufacturer. Visit a “gardener’s paradise” at Blake’s Nursery, celebrating 39 years in business. Forgot a tool for that camping trip? That’s okay, find it at Ullman Lumber Co. Inc., they have way more than lumber. Find everything from gas to groceries, beer to liquor, fishing to hunting supplies, guns to great gifts at The Fort. Chances are they have it. Buy a beautiful hanging basket from Brewer’s Greenhouse. Check out the grain silos, elevator, and wool house at Yellowstone feeds and swing inside to find great gifts like beautiful birdhouses and aprons. Fill that gas tank up at the Town Pump to ensure you reach your destination and find a great souvenir at the same time. Get the propane needed for that fun camping trip from Oie Motor Company.